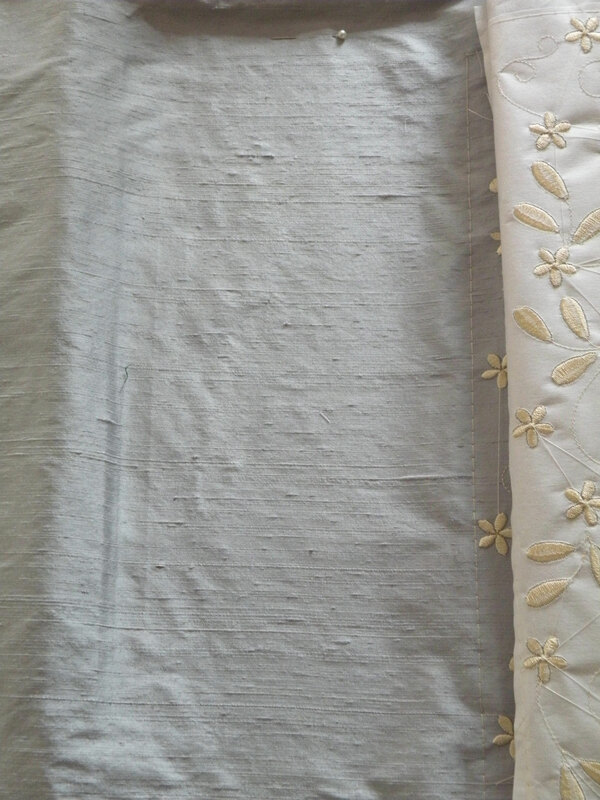 When I enter a fabric store I always head for the silk and the embroidered fabrics. 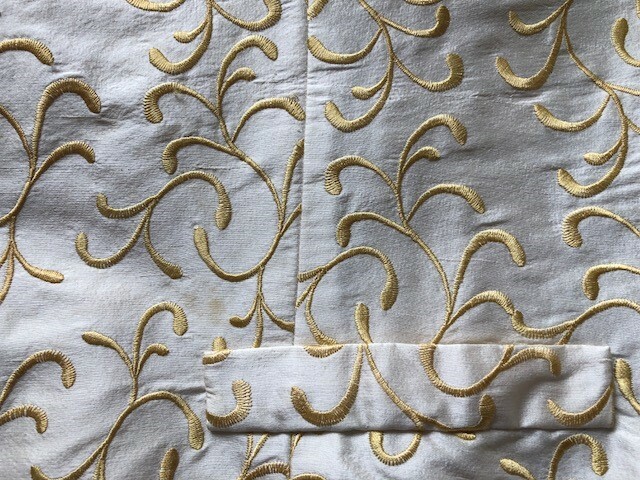 Usually I am disappointed about the lack of choices, so I have always loved the idea of creating my own embroidered fabric, as is allows me to make my own very unique fabric. It is very easy to do and works much like a jigsaw puzzle…. My first project was creating fabric for seven wedding waistcoats as the bride could not find the right fabric for her colour scheme. This involved a huge amount of hoopings, probably over fifteen per waistcoat. The challenge was finding a design shape that fit above, below and each side of itself to give the perfect all over effect. For this I created a simple scroll type design. My next challenge came with my first collection, Dainty Vines and for that I created the Dainty vines fabric block. 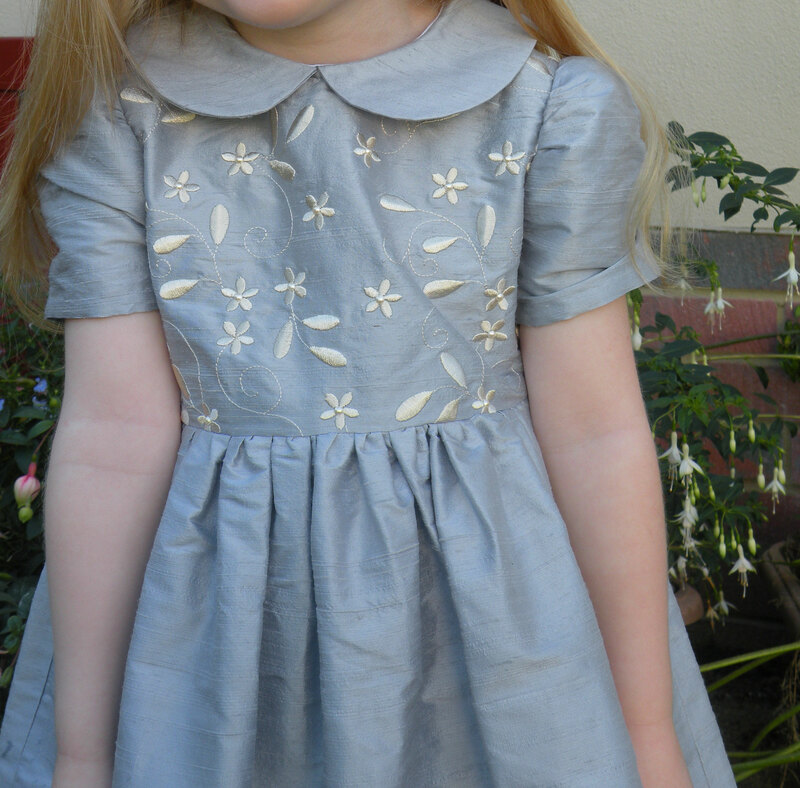 I decided I would embroider fabric for the bodice on a dress for my grand daughter. 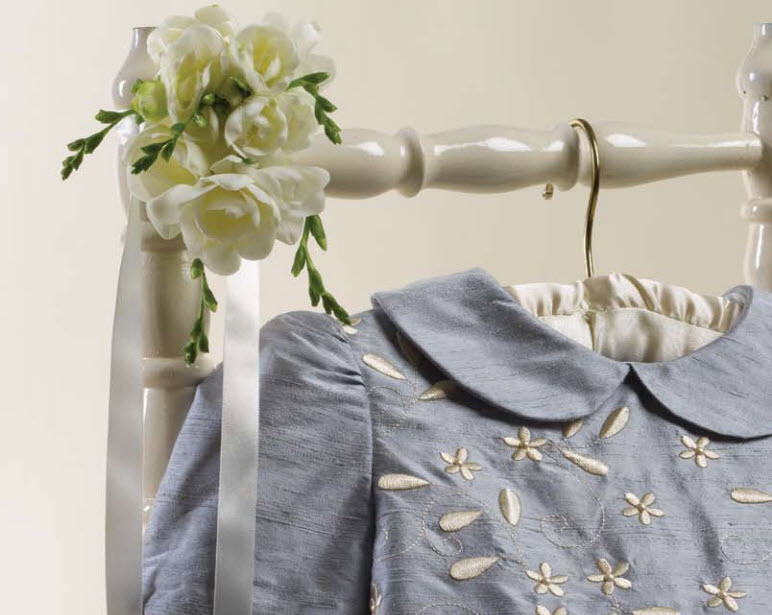 I used pale blue silk dupion for this dress, and embroidered it with Sulky Rayon 1071 off white. Creating the embroidered fabric beforehand is in my opinion so much easier than embroidering the fabric pieces of a cut out bodice. You may want to consider this for embroidery work on collars and cuffs and other small areas. The larger the hoop the quicker your embroidered fabric will be finished. Obviously it is important to create more fabric than you need, then when it comes to cutting out the sections, you can move the pieces around to get the best coverage. As this was quite open embroidery I did not attempt to match the back pieces of the bodice. The embroidery was done in my 360 mm x 150 mm hoop, involving several hoopings. I found that it was helpful to remove excess stabilizer from each design before adding the next one, so it did not build up. Each design sat nicely against the next one so the alignment was easy and even if there was some misalignment this did not show. I would advise that your first attempt at embroidered fabric is something similar. 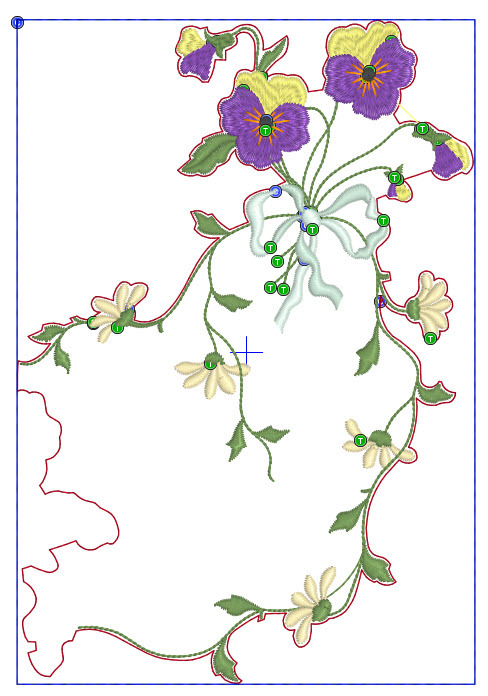 You can see the outlines of each designs butted up against each other and any obvious gaps can be quickly filled with one of the little flowers. As you can see I popped a few hot fixed pearls in the centres of the flowers. 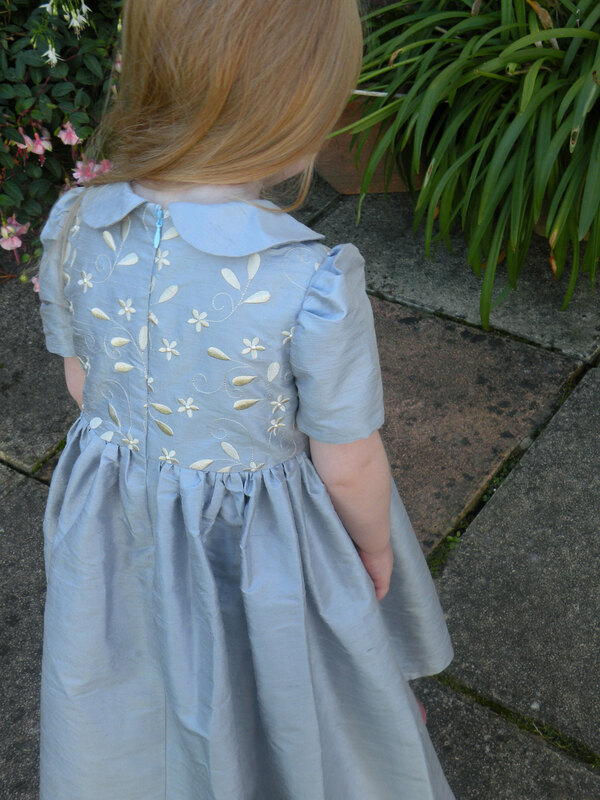 The finished dress was submitted as my first article published in the UK’s Flair magazine back around 2009. 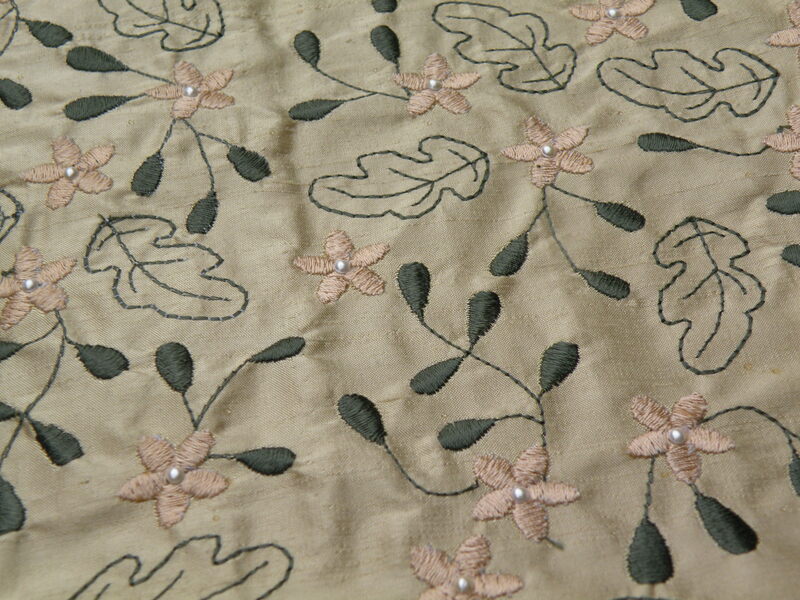 My next project came with a fabric block created with my Graceful Oak Leaves collection for an embroidered cushion. 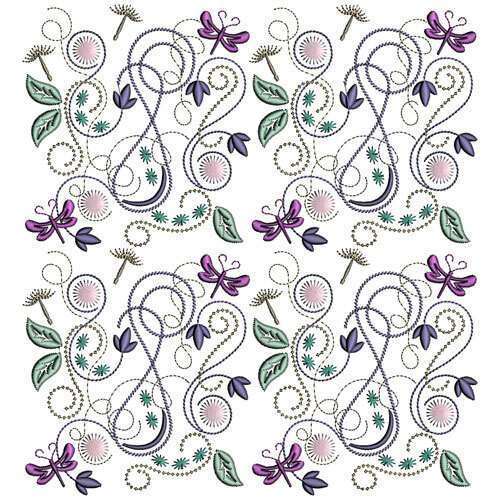 This is also quite a open type embroidery and perfect for creating embroidered fabric in several colours quickly and easily. 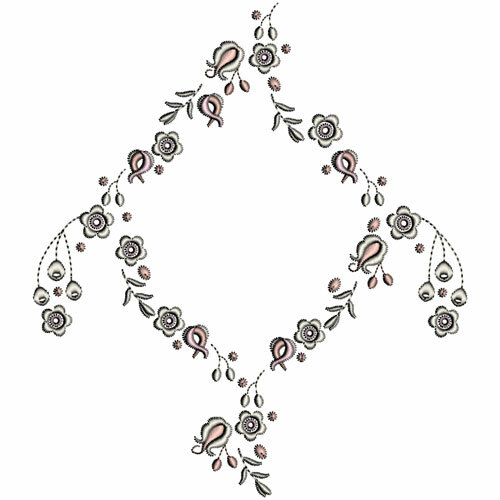 There are many designs at Graceful Embroidery that are also suitable for creating embroidered fabric. 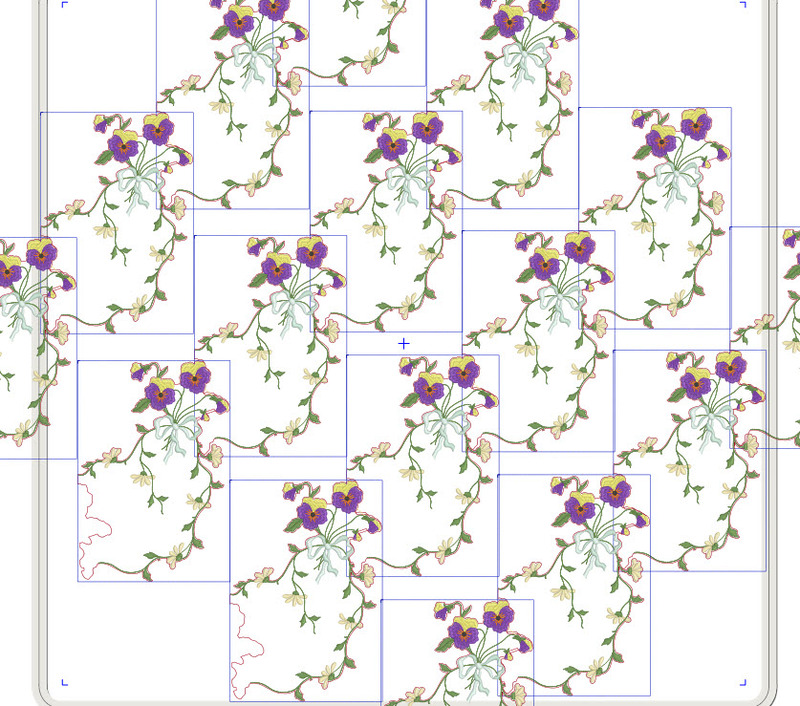 This design from Heartsease 3 will create an interesting fabric, where lots of fabric is required. 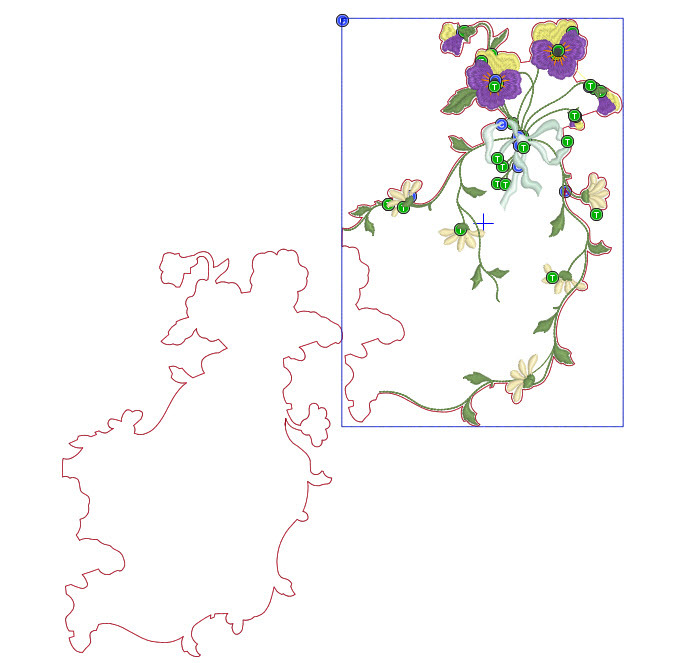 Each design needs to placed in such a way that the flowers sit between the open tendrils. 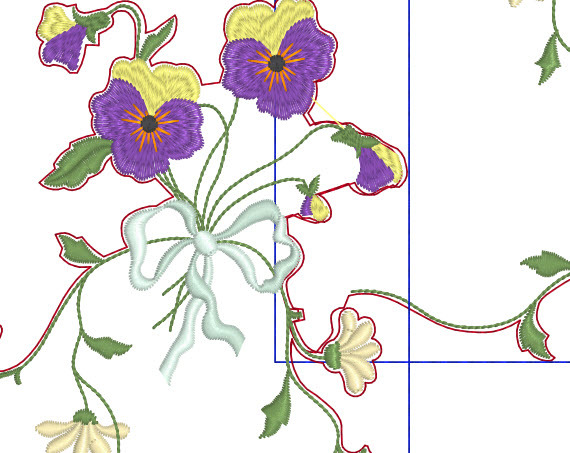 Here you see the design with Outline alignment stitches (OAS) open in my software. These makes aligning each design so much easier. Hoop just one layer of stabiliser, and stitch out the first set of stitches, shown here in red. Then you can see the basic outline of the design. Notice how the outlines will slot into each other if the second outline is moved to the right. Here you can see the alignment happening. Start at the top of your fabric and work down or along depending on the designs and how they match. If something goes out of line correct it on the next alignment. After each design is stitched out remove the fabric from the hoop and as much stabiliser as possible from around the edges. Keep the alignment stitches as they may help you in subsequent positioning. Hoop up another piece of stabiliser, stitch out the red Outline alignment stitches and use them to place the existing embroidery in the right place. Pin carefully outside the stitching area or use temporary adhesive hold everything in place. Now stitch the second set of OAS, which are blue. They will secure your fabric to the stabiliser. Check everything is where it should be. Remove the hoop from the machine if necessary and unpick and re position if you are not happy. 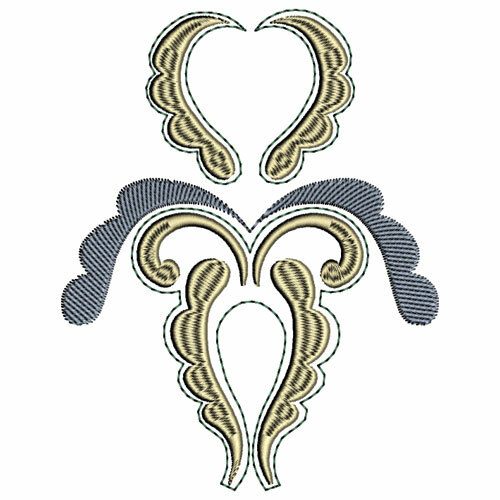 This the overall effect of embroidering out this design. I remember that it took me a while to get it to fit nicely with itself. This block from Amore Grunge 4 will create a dense fabric. Each design needs a small amount of overlap so that each square is not obvious. The same goes for this similar block from Morning Grunge 4. This all over fabric embroidery was created with Folk roses 4, #9. 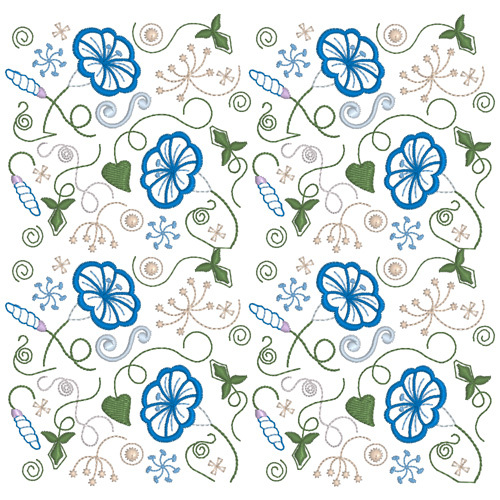 When I started scrolling through my collections I found other designs that I had not considered before to be suitable for embroidered fabric, like this one from Campions 2. 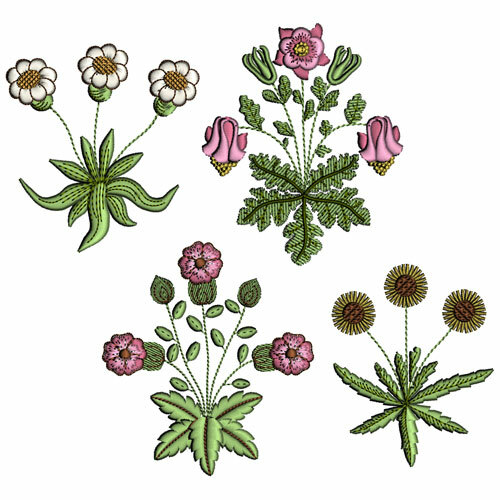 After all these designs were taken from a William Morris print, so they are perfect. 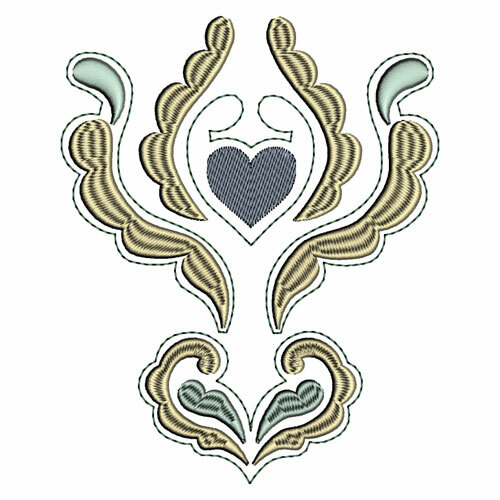 Smoky Mornings 5 has several designs which would look great for embroidered fabric for a man’s waistcoat. Place them in alternate rows for a very classy look and a unique fabric nobody else will be wearing. 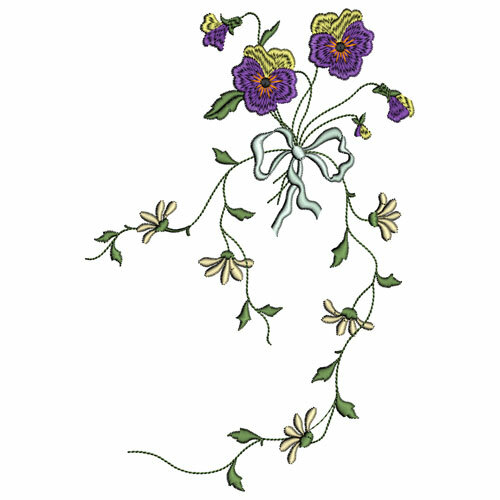 Lastly this is a similar type design as the Heartsease one, from Une Petit Princesse 3, creating a beautiful fabric of diamond shaped embroidery. Now you see the basics of this method, I am sure you will find designs that can be used successfully. The more I look, the more I find. 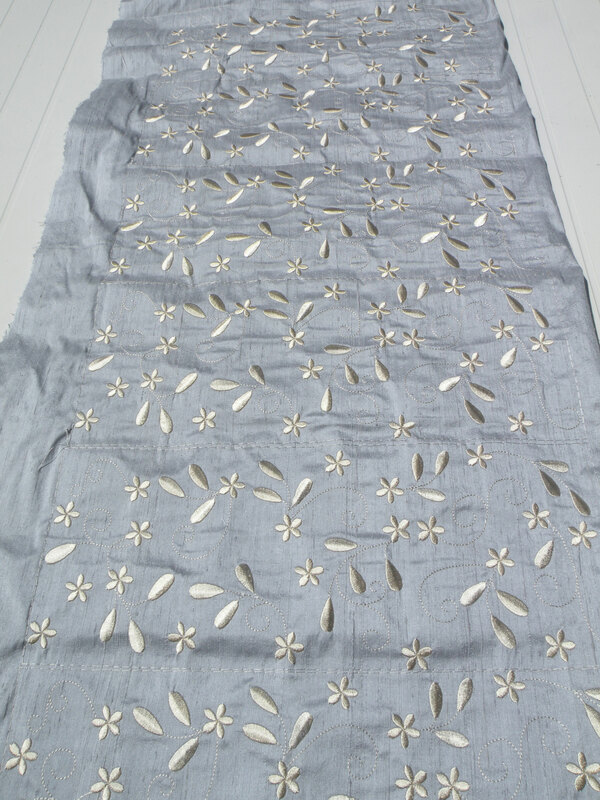 Do share in the comments section of this post your ideas for embroidered fabric and any particular designs from Graceful Embroidery that lend themselves to being part of your next project. There is no better time to stock up on embroidery designs at Graceful Embroidery than now, while the grandsale is running until 7th May, 2018. Don’t forget that my new website has a search button at the top right so you can find any of these designs quickly and easily. 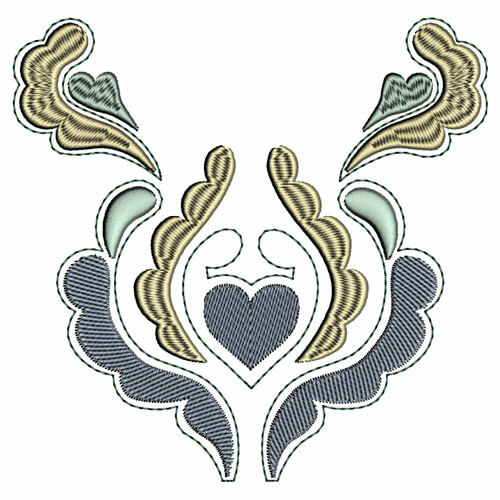 This entry was posted in Discussing machine embroidery, Embroidery projects, Tutorials and tagged combining embroidery designs, development of embroidery, embroidery on silk, heirloom embroidery, machine embroidery, Making embroidered fabric, Outline alignment stitches. Bookmark the permalink. Thank you for your experienced insights in how to apply overall designs. This is an area I would like to explore more. If one were on a budget could you start by working on cottons rather than silk? Think I’ll try that out for a blouse. Good idea. Never try something new on precious and expensive fabric. I use curtain lining as my cheap fabric. Wow Hazel. Beautiful work. Thanks for the wonderful educational piece! Beautiful work!! I have wondered how you did this — thank you so much for teaching me so much. Thank you Hazel for sharing your expertise in designing our own fabric . Your step by step written instruction accompanied by pictures are easy to understand. My problem would be in rehooping, For some reason, I have never been able to accomplish this skill, and matching the areas are so crucial. Your embroidered fabric is so elegant. 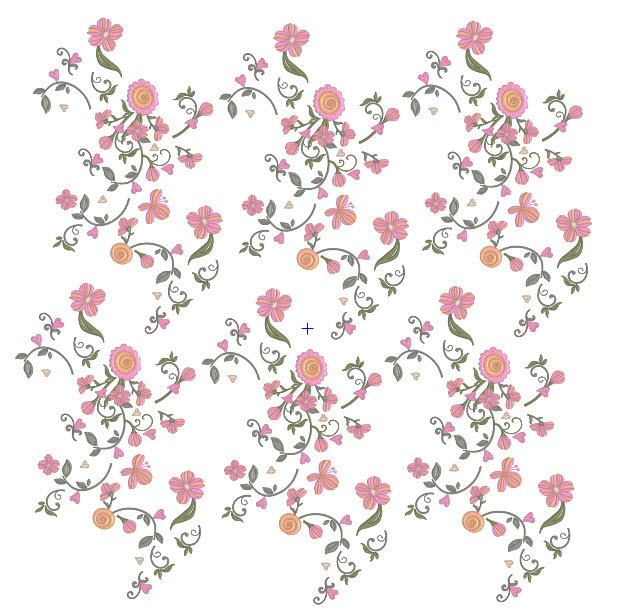 You should try selling your embroidered fabric designs to companies that produce fabric. 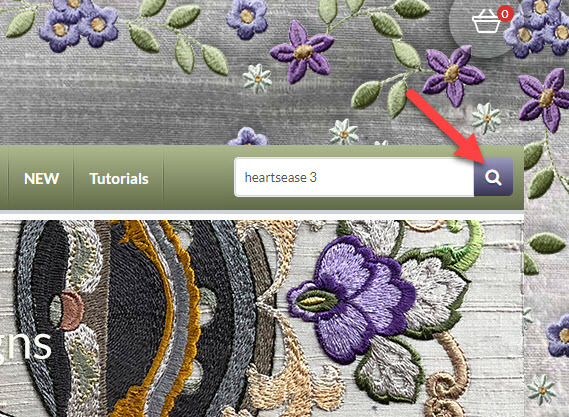 Have you used my Outline alignment stitches (OAS)? They make positioning so much easier. Check out my tutorials on using them while the sale is on. Starting in a small way and building up your skills slowly is the best way to learn and get confident.